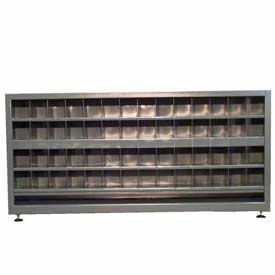 85" High Easy to Assemble Parts Bin Units Help Maintain Organized Tool Rooms, Workshops Or Assembly Operations. Bin shelving units sort and store equipment and parts with high visibility and easy access. Ribbed steel shelves are designed with a box beam construction for added support. Bin cabinets have a durable, scratch resistant gray baked enamel finish for years of reliable service. Choose from 12" or 18" deep models with a variety of bin sizes. Easy to assemble. 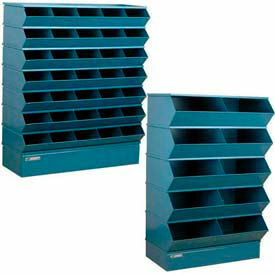 Hallowell® Hi-Tech Metal Bin Shelving Units Are Used For Workshops, Storage Closets, Warehouses And More. 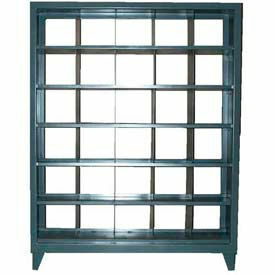 Hallowell® Hi-Tech Metal Bin Shelving Units are made of steel for long lasting durability and strength. Shelving units provide storage of smaller parts and packaged goods. Unit measures 36" wide and 7'-3" high. Available with shelf quantities of 8, 10, 12, and 14. Tennsco Welded Compartment Cubby Storage Cabinets Are Built To Withstand Rugged Use In Warehouses, Employee Break Rooms, Early Childhood Classrooms And More. Tennsco Welded Compartment Cubby Storage Cabinets feature high strength steel throughout for long lasting durability and reliable service. Compartment cabinets include three double coat hooks and adjustable shelves that can be easily repositioned in 2" increments to accommodate hanging clothes, backpacks, tall tools and more. Ships assembled and ready to use. Cabinet is 34-1/2"Wx13-1/2"D with available heights of 30", 40", 52" 66" and 78". Color finishes are Arctic White, Black, Bright Red, Regal Blue and Sun Flower Yellow. 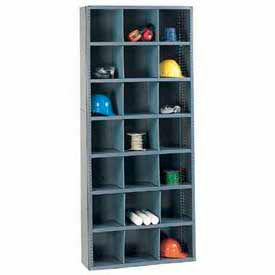 These 74" High Steel Storage Cabinets Feature Built-In Storage Compartments For Organized Storage In Any Environment. 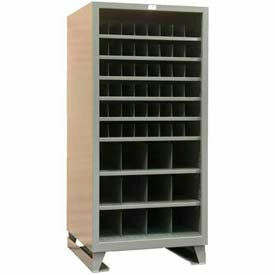 Bin cabinets are made using durable 16 gauge steel. These steel storage cabinets include 6 fixed height shelves with 3 compartments. Each compartment measures 12"W x 20"D x 12"H. Compartments feature fixed dividers that taper to 6"H at front. Cabinets measure 36"W x 21"D x 74"H.
Cabinet is also available with a channel reinforced door that includes locking handle for security. Lyon® Pre-Engineered 36 Inch Wide Bin Shelving Units Provide Storage For Materials Requiring Assigned Locations. 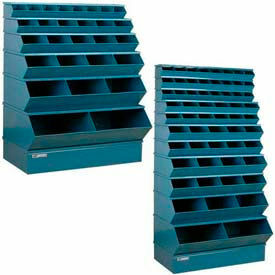 Lyon® Pre-Engineered 36 Inch Wide Bin Shelving Units are made from steel for strength and lasting durability. Shelf dividers individually adjustable side-to-side on 3" centers. Dividers may be removed or added to maximize storage possibilities. Available with 16, 36 or 38 compartments on 8 or 10 traditional shelves. Shelves measuring 24"D allow 700 lb. capacity. Shelves measuring 18" allow 650 lb. capacity. Shelves measuring 12" allow 750 lbs. in 16-compartment units, 550 lbs in 36 compartment units and 650 lbs. in 38 compartment units. Add-On Shelves allow seamless additions onto starter Bin Shelving Units. 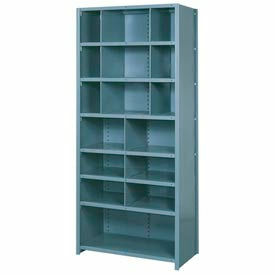 Units measure 36"W x 84"H. Available shelf types are Heavy Duty And Traditional. Color finishes are Gray and Putty. Bin quantities are 16, 36 and 38. Lifetime Limited Warranty. Stackbin® Steel Compartment Sectional Units Are Used For Storage In Workshops, Garages, Warehouses And More. Stackbin® Steel Compartment Sectional Units are made using all-welded heavy-gauge steel with a baked enamel finish for lasting durability. Angled compartment openings allow easy access to contents. 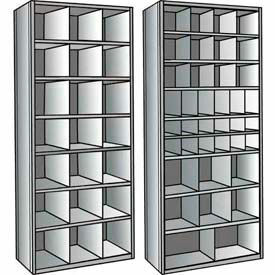 Sectional units may be stacked to create custom-sized storage units. Available units range in size from 6 compartments up to 50 compartments. Choose from a variety of colors. Stackbin® Steel Compartment Multi-Size Sectional Units Are Used For Storage In Workshops, Garages, Warehouses And More. Stackbin® Steel Compartment Multi-Size Sectional Units are made using all-welded heavy-gauge steel with a baked enamel finish for lasting durability. Angled openings allow easy access to contents. Individual tiers stack on top of one another and may be reconfigured at any time. 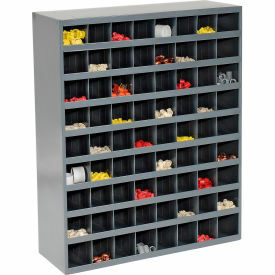 Units are available in 28 Compartment or 59 Compartment sizes in a variety of colors. This pass thru bin rack is used in storerooms when doors are not available to obtain small inventory parts. Keep your product safe inside and allocate to employees as needed. This item measures 60" w x 16" d x 72" h, overall height is 78." Each opening is 11" w x 10" h.
Strong Hold® Heavy Duty Open-Metal Bin Storage Unit Is Used For Storing And Organizing A Large Number Of Smaller Items. Strong Hold® Heavy Duty Open-Metal Bin Storage Unit is constructed of solid steel with a durable dark gray finish for long lasting strength and dependability. 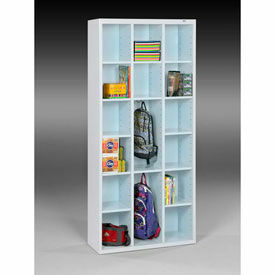 36 inch square storage unit comes with 4-1/2 and 8-1/2 inch height vertical dividers adjustable on 2 inch centers. 6 inch height, full depth skid legs are provided for ease in mobility. Overall unit height is 78 inches. 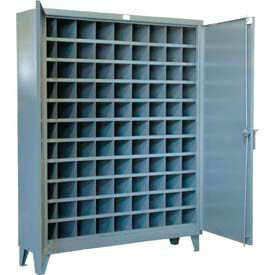 To help accommodate assembly lines and where multiple storage is needed, this cabinet is loaded with bin storage space. Bins are located on the back as well as the front. There are 56 openings on each side, measuring 6" w x 10" d x 6" h. We have added leg levelers to adjust your cabinet to an uneven surface. Stronghold® Heavy Duty Metal Bin Compartment Cabinets Are Used For Storing Small Heavy Parts And Tools In Workshops, Laboratories, Warehouses And More. Stronghold® Heavy Duty Metal Bin Compartment Cabinets are made using 12-gauge steel for lasting durability and resistance to corrosion. No-Leg Cabinets are built with no legs, allowing them to be used in forming solid walls in maintenance and store-house departments. 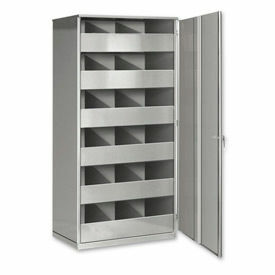 Adjustable Compartment Cabinets include vertical dividers allowing easy customization of bin sizes. Front label space for easy identification of contents available on some models. All cabinets are built with a 2-door configuration. Available compartment quantities are 48, 54, 66, 72, 99, 110, and Adjustable. Dimensions vary per model. Stronghold Double Door, Independent Lock Cabinet With Dividers. The Stronghold Double Door, Independent Lock Cabinet has two locking handles and divided in the center. 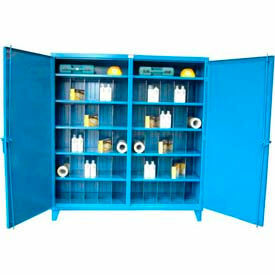 This two-shift cabinet has 40 adjustable dividers and more can be added. This cabinet is constructed of steel for long lasting durability and is finished in dark gray. This cabinet measures 72" wide, 78" high and 24" deep, making it a great fit for areas where space is limited.